John Fairfield was one of the most gifted and notorious abolitionist fighting for freedom for all in the decade before the American Civil War. In the pages of Finding Fairfield, Jeffrey Copeland recounts his adventures in gathering the details and information needed to bring Fairfield’s tale to life. These adventures took him to historic homes, important landmarks of the pre-Civil War era, Underground Railroad depots/museums, and other sites frequented by John Fairfield and others who proudly carried the torch of abolitionism. Jeffrey’s journey was not always an easy one: getting terribly lost in the middle of nowhere while searching the Sandy & Beaver Canal system (a waterway once used to transport runaway slaves, by boat, to freedom), participating in a “ghost tour” near one of the most important Underground Railroad havens, and even spending the night in a haunted inn where John Fairfield himself once slept. 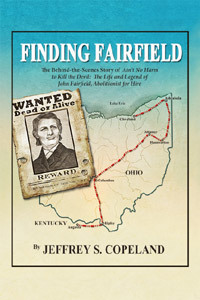 Finding Fairfield also recounts Copeland’s efforts to re-trace the journey made by John Fairfield when he once led nine slaves from Kentucky to their freedom in Canada. Finding Fairfield is both the story of a writer’s craft and an engaging travelogue – a combination sure to please those who love American history and stories of “important Americans” who have had such profound impact on the world we live in today.